It takes just 10 minutes to put together this gorgeous crab dip with red peppers and green onions—plus some time in the oven to make it hot and bubbly. Spoon into 9-inch pie plate lightly sprayed with cooking spray. Bake 20 to 25 min. or until hot and bubbly. Garnish with additional chopped red peppers and sliced green onions just before serving. 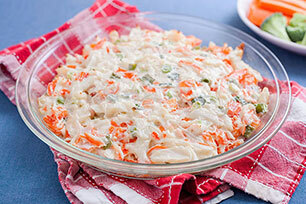 Serve with assorted crackers and cut-up fresh vegetables.